We love our pets and we love our homes, and keeping them both safe is important. Installing a new fence is a great way to protect your dog and give him the space he needs to run and play while at the same time adding style and privacy to your home. We spoke with Kristin Rickman, Emergency Response Division Manager of PETA, who shared some tips on how to turn your backyard into a safe playground for your four-legged friend. A pet is not a furry statue. Companion animals, even the sleepy and lazy ones, need to get outside not only to answer the call of nature, but to sniff and explore the world. While the amount of outdoor activity your dog needs will vary from breed to breed and dog to dog, all dogs need daily outdoor stimulation to keep them physically and mentally fit. 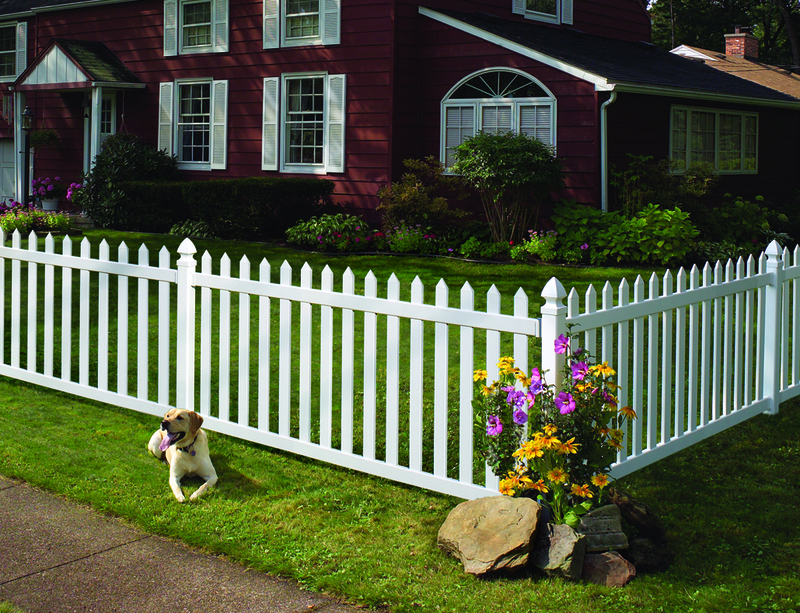 A privacy fence, like CertainTeed’s Chesterfield, is a great option for pet owners. Privacy fences. A privacy fence is a great way to keep your dog safe and your home looking stylish. Semi-private fences. A semi-private fence like CertainTeed’s Breezewood Select Cedar Texture adds charm and can give your yard a greater sense of space. Picket fences. Except for the smallest dogs, picket fences don’t offer enough height to safely keep the dog contained. Invisible fences. The shock associated with the fence may not be enough deterrent to keep dogs from running off. Also, they offer no protection for the dog, as people and other animals can easily cross the treshold. Backyard fences have come a long way since the days of chain link. These fences are designed with your neighbors in mind, offering the same attractive look on both sides of the fence. Visit our fencing guide to find styles perfect for your home and yard. Invisible fencing uses electric shocks and noises to keep a dog inside a yard. These invisible fences are cruel and for more ways than you may realize. “No animal deserves to be shocked for crossing an invisible line,” said Rickman. PETA has opposed invisible fences since the technology first appeared on the market and continues to warn pet owners of the potential dangers. Not only do these fences harm your animal, an invisible fence may not be enough of a deterrent to prevent your pet from running away. “When a dog sees something very attractive, like a squirrel, the dog may deem that the shock he knows he’s going to get is worth it to chase the squirrel,” Rickman said. The dog will chase after the squirrel even after getting the shock for crossing the invisible barrier. But once the squirrel runs up a tree, the dog is stuck outside the yard and knows he’ll get another shock if he attempts to come back. As much as the dog wants to return home, he’s not willing to get shocked to do so. “We’ve seen circumstances in which the dog will get stuck on the other side of the fence and is afraid to come back to the yard,” said Rickman. If that wasn’t enough to turn you off invisible fences, know that these barriers offer little protection for your four-legged family member. Curious children, other animals and strangers can walk right up to a dog defended only via an invisible fence. And dog-theft is a very real crime that is on the rise. According to the American Kennel Club, 71 dogs were reported stolen in 2008 and that number skyrocketed to 637 in 2014 and continues to grow. “There are people who drive around looking for unattended dogs,” said Rickman. “They steal them and sell them to laboratories or sell them to dog fighters.” A supervised dog in a yard is much safer than an unsupervised dog out in the open. The best defense is a fence you, your dog, and everyone else can see. A fence can be a dog’s best friend. 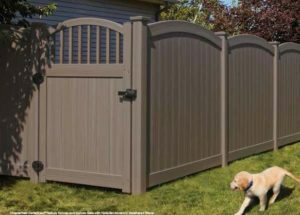 Not only will it help keep your dog safe and happy, but with new materials and styles, adding a fence can greatly improve the look of your home and yard. Check out CertainTeed.com to see new styles options, and to find a contractor in your area, use our Find a Pro tool. Need help installing that fence? We’re here for you. Plus, 7 tips to inspire your exterior renovation and how you’ll pay for it. A fenced-in yard is the best way to keep your dog safe. All fenced yards also need a secure gate with a latch that a persistent dog can’t pop open. Thanks for sharing. Thanks for mentioning how you should avoid getting an invisible fence for your dog. It is good to think that doing some research can help you find the best way to protect your home. Personally, I would also want to check with a fence contractor before buying one. I’ve been thinking about getting a dog and a cat for a little bit now, but I don’t have any fences in my yard. Now I know this is a must so that they don’t run off and never come back. As you mentioned, a privacy fence would be a great way to keep them inside while also giving me the peace of mind that people can’t be looking in my backyard. I like how you point out that the type of fence depends on the type of dog. My brother just got a new puppy, and she runs away pretty frequently. She’s not super big, so maybe a smaller fence would be adequate for keeping her in the yard. I think my brother would really benefit from talking with a fence contractor to learn about his different options. My husband and I just got a new puppy, and we really want her to run around outside whenever she wants too. We don’t have a fence, and we were wondering what kind of fence we should get for our dog. That is great that a privacy fence would be a great way to keep our dog safe and our home looking good. That sounds like a great option!